This satellite image is an example of a new tool available to those who want to understand the environment, if you look closely you can see a network of ancient game trails. These game trails were made by desert bighorn sheep accessing a deep shade resource. To understand any terrestrial environment one must know how to track and read sign. This skill allows you extend your awareness through time and distance. Part of this skill is understanding game trails, thus allowing you to look back much deeper in time than just tracking. This knowledge is a powerful asset. It allows you to understand many attributes of the environment that only an in depth knowledge of game trails can provide. One of the first things to understand about game trails is that the most common and enduring ones are made by large herbivores. The reason for this is relatively straightforward. Animals like bighorn sheep and deer are relatively numerous, heavy, and walk on hard hoofs. Smaller herbivores like a chipmunk or a rabbit also make game trails. However, their light weight and soft feet make these trails faint and relatively short-lived. Game trails of predators are far fewer. To start with there are fewer predators than herbivores, and predators tend to have large soft feet meant to quietly and stealthily contact the ground. To find one of these predatory game trails and recognize it for what it is, gives you a lot of information on the local population and stratagies of predator and prey. This predator trail was made by bobcats and coyotes the pile of droppings in the lower left of this picture confirms it. Any game trail can be viewed as a written response to the physical attributes of the environment such as terrain, plant life, water sources, and so on. The animals then take into account their own biomechanics such as vision, sense of smell, and energy usage to formulate a solution that is best for their survival. When this equation is answered in the same way over and over, we have a game trail. So once a game trail, "a solution” is established it becomes a separate yet integral part of the environment itself. This incredible library of information falls into the category of esoteric knowledge in this day and age, but it wasn’t always so. Those that know how to decipher this information can achieve a deeper more articulate presence and a more enlightened awareness in the environment. So let’s look at some of the common attributes many game trails have. The first we can decipher as, “the easiest way to get there”. While this might seem simple and straightforward this is often a more complex issue than what might be readily apparent. For instance attributes such as cliffs, thick brush, and water sources can influence the formation of a game trail that is many miles away from these barriers or strategic resources. Then the biomechanics of the animal itself will be an important factor in the formation and placement of a game trail. For instance animals such as deer and desert bighorn are" head heavy". That is to say they have long neck’s that place their head forward and high above their front feet, and they have relatively heavy heads, especially the males. This makes it difficult for them to go downhill even at a relatively shallow angle. Thus they will avoid this whenever they can. They are built relatively well to move across the level terrain or uphill. Because of this you’ll often find two different game trails into and out of a water source. One is primarily going up and away from the water and the other one is primarily down and to the water. The trail going down to the water is usually at a shallower angle than the trail leaving the water. The primary reason for this is that these animals go slowly and cautiously down to the water, and don’t want to spend a lot of time in a awkward posture. Whereas in leaving the water, the rough steep terrain can work to their benefit. An established game trail is used entirely or at least partly used by other animals and of course they do this by trying to use its attributes to their advantage. For instance many game trails that are made by sheep or deer tend to have the soil churned up by their hoofs. This often makes the ground lighter in color, which makes it easier to follow in moonlight. These game trails are relatively level, or another way of interpreting this situation, is to understand they are in a different angle from the rest of the terrain, which makes them reflect differently in moonlight. This effects the equation for both predator prey alike. There are a few game trails marked by ancient petroglyph’s, some no longer in use and some that are still in use. The presence of these petroglyphs indicate that these game trails can be thousands of years old. Through evidence like this one can see how the population that made these game trails has waxed and waned through the ages. Sometimes game trails are use seasonally or only in a dry or wet year. You can deduce these kind of things by looking at the trail and seeing if there’s any small annual plants growing undisturbed on the surface of the trail itself. Another basic concept that is crucial to understanding game trails is being able to see and understand the affect of erosion. 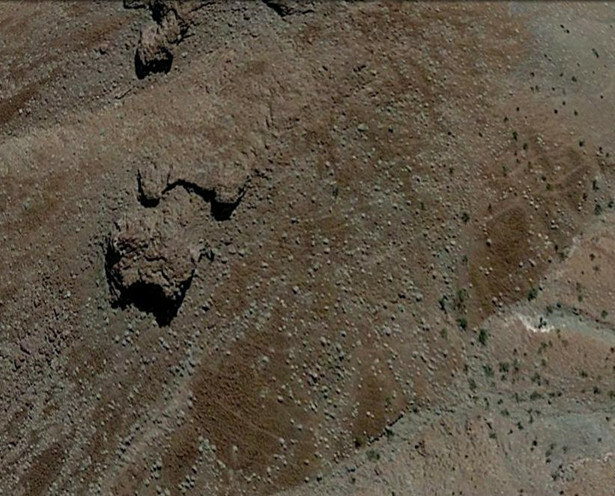 A game trail that is ancient will often affect the way a hill or alluvial deposit is eroding. This can often be seen when the erosion pattern does not fit well with the rest of the terrain. A game trail may be moving to the left or the right over the ages in a particular ravine. This is often one of the driving forces of erosion on that particular hillside or ravine. The process of erosion is accelerated by the animals breaking up the top level of the dirt and soil exposing it to wind, and often times it channels the rain water. Plants find it hard to grow on the trail itself in part because they are trampled by the animals. And beneath an inch or two of loose soil the ground is hard packed by the weight of these animals, making it difficult for a root system to survive. These attributes initiate all kinds of erosion patterns associated with game trails. Now that we have discussed some of the basics let’s take an imaginary walk along a game trail and see what we can learn and experience. 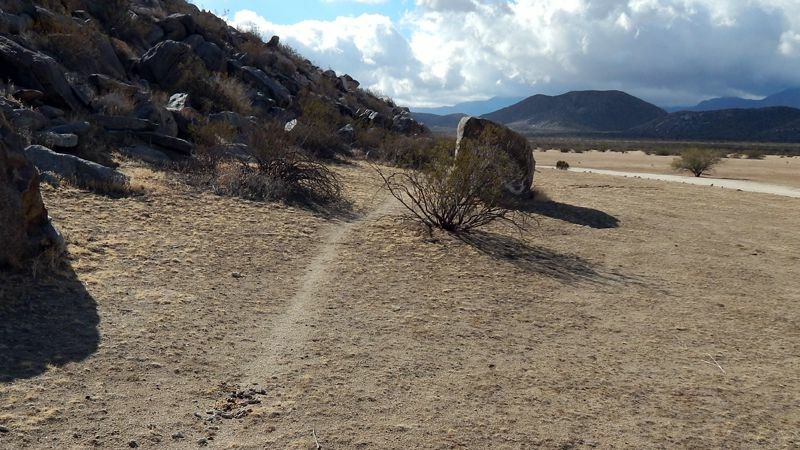 One of the more common experiences people have with game trails is that they are walking along through the desert or the woods and without any intention they find themselves walking on a game trail. Often times this is because of the overwhelming logic imposed by the terrain. Then there are other times consciously or subconsciously we have worked our way through a relatively complex equation and came up the proper and natural solution. Here we must remember the solution for the deer is different than that of the coyote or the human being. So to truly understand what is written in a game trail one must understand such things as the way of the deer, the coyote, and the way of one’s self. When you walk these game trails in silence and in a state of heightened awareness, you will learn such things. One of the primary things we must understand about any game trail is that we are very different animal than what made the trail we are on. For instance unless this game trail was made by elk, we are taller than most any other animal, and so our eyes, our point of view, is much higher. This makes a difference on how the trail is laid out and how you should walk it. Remember, as far as walking goes we’re the only two legged animals that will ever walk this trail. This too makes a difference as to how the trail is laid out and how we should walk it. All of this means we have to use our mind, our imagination, to conceive of things that are not readily apparent. For instance most animals, predator and prey, will sniff the trail from time to time to see who has been there and when. This is something beyond our capacity as humans. Yet equipped with the right knowledge we can imagine these things in a way that is practical and revealing. Because this knowledge, this language that is written into the landscape is a natural language to the human mind. We only need to take the time to learn it, and read it, to gain its wisdom. Like any library it is difficult to learn what is written in its books when people are talking, or concerned with interpersonal relationships. So it is in this library one should study alone and in silence to experience the full depth of what is written. If you cannot track and read sign you are environmentally illiterate.